This photo was shot in Rethymno, Crete with a Fujifilm X-Pro1 and a Fujinon XF18mm f/2 lens. I was particularly pleased with this street photo because it was one of those shots that was almost not a photo at all. On the day I made this photograph I had been out on a street hunt for several hours and I had been really enjoying myself taking photos. I hadn’t had the chance to shoot any pictures in the daylight for weeks, and I was really enjoying the fantastic winter sunlight in Rethymno, and lovely long shadows it was throwing as it pierced its way through gaps in buildings to create little pools of light here and there. I had my 18mm lens (27mm equivalent) set to a hyperfocal distance of 1.3m plus, and my exposure set manually for the sun’s highlights, so I didn’t have to worry about a thing on my X-Pro1 – I was snapping away like a maniac! 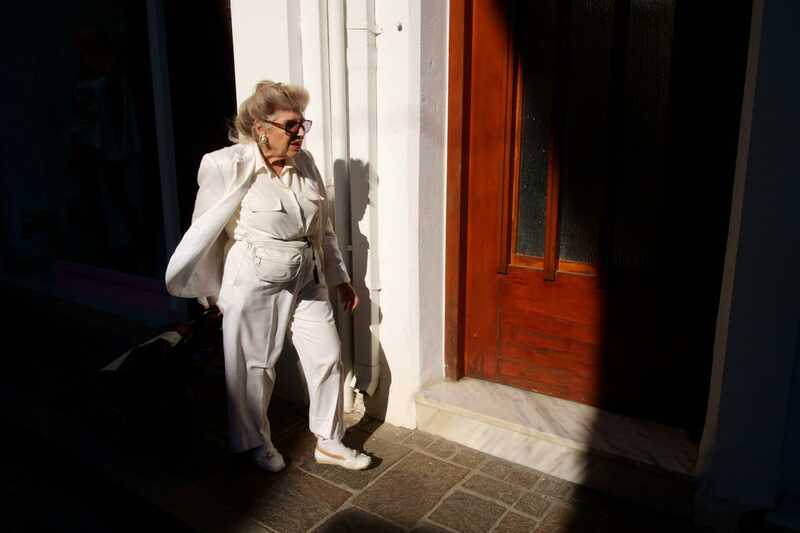 This particular shot was made on Arkadiou, one of Rethymno’s main shopping streets. I’d found one of those ‘pools’ of sunlight I mentioned earlier and I was trying to make shots of people’s faces as they stepped into the light. Unfortunately through a combination of my poor timing and the fact the ‘window’ for the sunlight lighting people was also dependent on them being exactly the right height, I didn’t get many keepers. So I started to make several shots of a door and wall on one side of the street as people stepped into the sunlight there. I got one photo in this location that I was sort of happy with, so I decided to move on to try somewhere different. 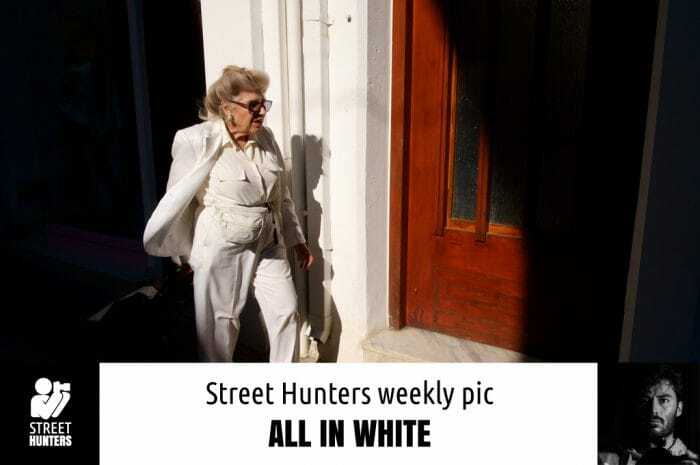 I hadn’t got more than about 20 paces up the street when I saw this woman dressed all in white walking along. As she was on the pavement I knew she’d be in the right spot for the light IF I could get back to my shooting location in time. So I considered my chances of getting back into position in time and figured I’d try it. I turned around and walked double pace in order to get back to my location. Nine times out of 10 when I try and get ahead of someone like this, and pre-plan a shot around one subject arriving at a certain point at a certain time something goes wrong – normally they change direction or go into a shop or something. But on this occasion my luck held. I fired the camera shutter about half a second too early as the subject is still a little in the shadow, but that did mean I captured the movement of her jacket. I’m glad I took the chance on this photo, as it turned out it was one of my favourites from the day’s street hunt! Fantastic shot… It’s such a great sense of victory to get it.